Syrian media reported on Tuesday that President Bashar Assad said the Israeli massacre against the unarmed Palestinian people should be stopped, the siege on Gaza should be immediately lifted and all crossings should be opened. 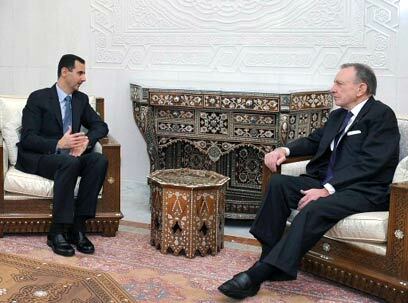 In a meeting held in Damascus with US Senator Arlen Specter (Rep.), a number of Mideast issue were discussed, particularly the Palestinian problem. Also present at the meeting were Syrian Foreign Minister Walid Moallem, Assad's advisor Dr. Buthaina Shaaban and the delegation accompanying Specter. On Sunday Syria announced that Damascus was putting an end to the indirect peace talks with Syria following the military operation in Gaza. A Syrian official that remained anonymous said, "The Israeli aggression closes all doors" in taking steps towards achieving a peace agreement in the region. Meanwhile, the Organization of the Islamic Conference announced a special meeting will be held in the Saudi Arabian city of Jeddah on Saturday to discuss Israel's attack on Gaza. Fifty-seven Muslim and Arab countries are part of the organization, with Syria and Pakistan being two of the nations on its acting board. In addition, foreign ministers of Arab League nations are scheduled to hold a special meeting on the Gaza situation on Wednesday. The meeting was initially set for Sunday, but was rescheduled due to minister's prior engagements. Arab UN envoys have attempted to pass a declaration calling on Israel to abide by the Security Council's call for an immediate end to all military activities in the Gaza Strip. The attempt to pass the declaration failed, but the Arab envoys appear determined to convene an emergency meeting of the 15-member body on Tuesday or Wednesday at the latest. See all talkbacks "Assad: Stop Israeli massacre in Gaza"